Parts of the Great Lakes and Upper Ohio Valley could see severe weather late this week. A powerful storm system will sweep into the Ohio and Tennessee Valleys Friday into Saturday. This same system could bring over a foot of snow to parts of the Northern Plains and Upper Midwest. 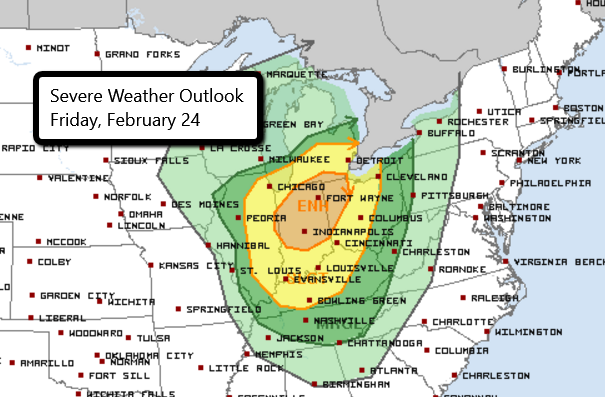 There is an Enhanced Risk for severe storms in northern Indiana and western Ohio. There is a Slight Risk for severe storms from southern Michigan into Kentucky and from eastern Illinois into Ohio. Major cities under the threat for severe weather on Friday include Chicago, IL, Indianapolis, IN, Detroit, MI, Nashville, TN, and Cleveland, OH. The main risk associated with storms that develop will be damaging wind gusts. At this time, it does look like there could be an isolated tornado threat as well.